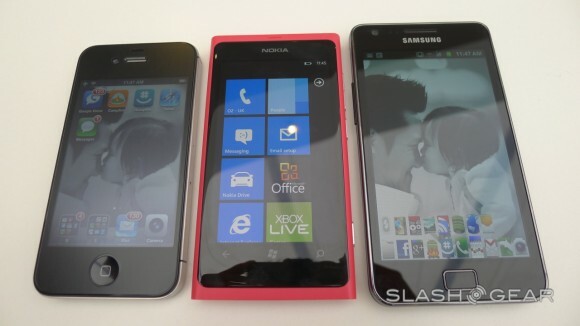 The Samsung Galaxy S2, the flagship Android handset with 1.2 GHz Dual Core is put against the Nokia 800 with 1.4GHz single core by SlashGear. SGS 2 using the stock browser whilst Nokia Lumia 800 using IE9. There’s another video with iPhone 4S which uses Safari. Oddly, when pages are set not to load flash, the SGS2 was slower. Both have the usual pinch zoom, text reflow. Also check out the vibrancy of the 800’s display. I found this hard to show off in camera, it’s so much better in person. Note that despite Chris saying the iPhone is Done in loading the full site, you can see some ads showing in the 800 screen that loads AFTER the 800. (Not being picky, just noticing ad load times as we’re having a problem here with ads – they’re not appearing and we kinda need them for the hosting bill). Also when Chris tries to open another page, it is double tapped zoomed on the 800 (and thus not loading a new page) whilst the iPhone 4S was already before the start gun. Page rotation is marginally faster on the dual core iPhone 4S. I’m frankly surprised it’s that fast and fluid at all. I didn’t pay attention to the rotation on 800 when I had it, but it was always something I had been complementing iPhone and iPad for. Beautiful rotate animation and fast.